These are my opinions about pool related products that I personally own. I’m not paid to say what I think, which is good because i don’t pull any punches. If I think it’s crap I will say so. This book should be required reading for anyone that wants to improve their game. Ray Martin is a no-nonsense kind of guy and it really shows in his book. His “just the facts” approach to instruction is a breath of fresh air. This book has been around a long time and it continues to be at the head of the pack as far as instructional materials are concerned. What surprises me the most about this book are the people who buy it, read some of it and put it on a shelf to collect dust without ever really giving it a serious effort. I know a guy that bought this book and still asks me how to play a certain shot. I tell him, “You got the answer, its been sitting on your shelf for over a year!” This book wont make you a better player, but it will tell you what you need to know to make yourself a better player. Do you ever sit and watch other players (good ones) and say “Wait a minute, how did they make that shot?” Well, chances are that the answer is in Ray Martins book. At first glance you may think that Ray has pulled a fast one on you. I remember thinking all he was doing was introducing 30 shots or so and showing different variations of them, but that simply isn’t the case. Ray does a great job of illustrating shots that come up allot more than you think and shows you the best way to deal with them when they do. He has an impressive background in straight pool that shows in his shot selection. He explains how to hit each shot, what english to use and how hard or soft to hit the cue ball. Ray is a big proponent of keeping things simple. He comes from the same school of thought that dictates that you don’t move the cue ball any more than necessary. Plans changes with every hit of the cue ball so its important be able to change your strategy during the match. 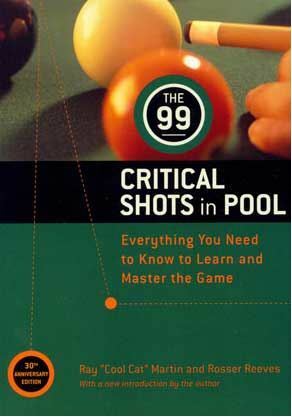 The biggest thing I took away from this book is confidence that I now knew how to deal with certain shots that my opponents most likely wont know. If you can just study 10 shots a week, master them and memorize them, your game will take a huge leap by the time you finish the book. If nothing else you should gain a valuable new perspective on how to look at table layouts and that alone will be worth the purchase price. Have you shot all 99 shots? In this post I am going to cover several products I have bought in my search for the perfect tip tool. I will only comment on the tools I have owned and used. NOT! In my opinion it is an ok scuffer but is not the all in one tool it claims to be. There are 2 main reasons I am not too fond of this tool. 1, the burnisher, while it does work to some degree it can cause more harm than good if you are not careful in the way you do it, causing damage to the ferule. 2, the trimmer on the side of the tool. This device is meant to sand down the sides of your tip to make it flush with the ferule. WARNING, you run the risk of damaging your ferule when you do this. Think about it, in order to get the tip flush with the ferule the sand paper will come in contact with the ferule. NOT GOOD. For this reason alone I have quit using this tool. Not to mention you have to buy replaceable pads for it. I consider it to be a good tip shaper as far as the tip radius is concerned but that is about it. I give it a 4 out of 10 rating. This little tool is the best thing I have found for scuffing the tip. What makes it so great is that you can scuff the tip without removing hardly any of the tips leather. Might not sound like a big deal,but when your favorite tip costs around 20 bucks, you want it to last as long as possible. 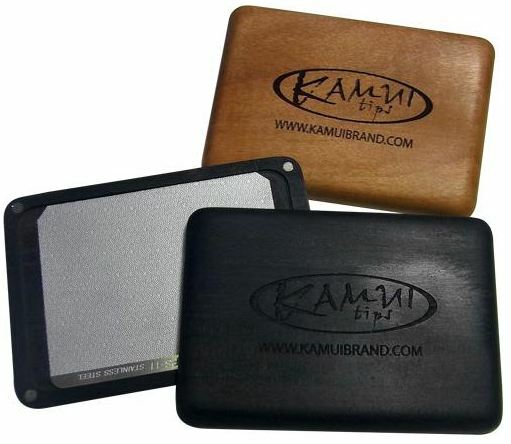 Since it uses metal instead of sandpaper it should last you a lifetime if used correctly. It’s surface is stainless steel that has laser cut ridges that are designed to agitate the fibers of the tip rather than completely remove them. It’s shell is made of hard wood, mine is ebony, and has a nice finish. It has a magnet in each corner to keep it closed when not in use. It’s about the size of a credit card and fits nicely into my case. Beware, it comes at a hefty price like most Kamui products. But when I consider the longevity of this product I don’t mind at all. There chalk however is another matter entirely. Kamui says it’s the only tool you need to do proper maintenance to your tip. I disagree. This tool is only designed for scuffing. In my opinion there are other aspects of tip maintenance so it falls a little short of their all in one advertising. All things considered it is a solid buy, I give it a 8 out of 10. NOTE: When I bought mine they were $35.00, at the time of this writing 3 online stores had it for sale at 45.99. Personally I think this is too high, please keep in mind I wrote this based on my purchase price and not the current price. I don’t say this sort of thing very often but stay away from this piece of equipment. I had tried it several times and came to the conclusion that it is a poor design. 1. Once you’ve prepped the ferule and tip you put the glue on the tip and place it on top of the ferule and quickly slide it into the clamp. 2. Slide the ring up to engage the clamp. This is supposed to center the tip onto the ferule. 3. Let dry and remove. Everything in here is total junk except for the shaft slicker. This kit was given to me by a well-meaning friend. While it is a very nice gesture I want you to know that it is a complete waste of money. 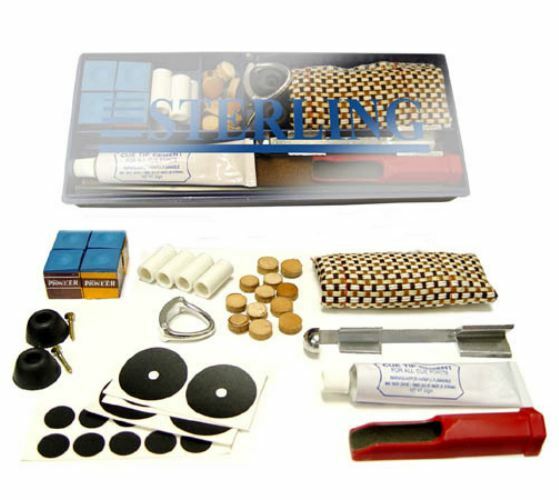 Everything in this kit is made of the cheapest materials and are a complete waste of time. The tips are worthless uncompressed pieces of regular leather that will flatten out the first time they are used. The chalk is the worst I have seen. 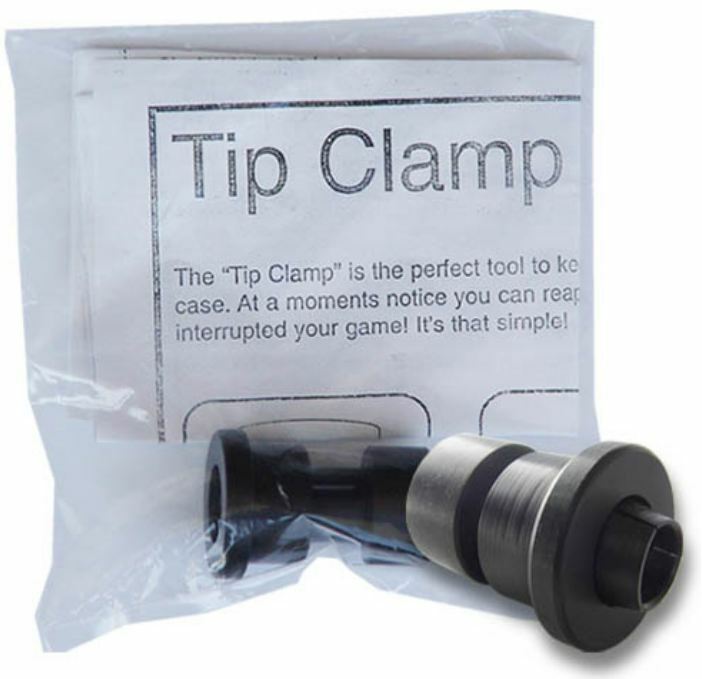 The tips clamp is cheap pot metal that will damaged your shaft when used. The glue is just a tube of Elmer’s glue. ETC. I got this as a freebee from ordering a bunch of other stuff. 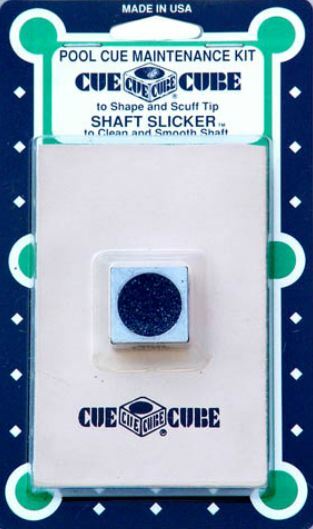 The Cue Cube is a 2 in 1 deal. It’s a shaper and a scuffer. All in all it does a decent job at both tasks. I don’t really care for the scuffer part because I think it removes too much material and I prefer my Kamui Gator grip for scuffing. It will last a very long time though and if you can keep from loosing it, you will find that it comes in handy. The leather piece is designed to be used as a shaft slicker. I use this as the last step in cleaning my cue shaft. It will make it smooth as glass and also can be used to burnish the sides of your tip. I have seen this sell between 5-10 bucks and is well worth it for those on a budget. I give it a 6 out of 10. That’s all for now. I will post more when I get time. I bought this book awhile back and have read it twice. To be honest I think I need to read it a couple more times to really digest it all. Mr. Capelle does a decent job with this book. There are several gems in it that can help you with your mental game as is relates to pool. Personally I think he falls into the same trap as most pool instructional authors by user too much filler in his book but he gets the point across none the less. Are you have trouble focusing while playing? Are you dogging critical shots? Are you dragged down by self imposed pressure? Well then, this may be the book for you. Philip fills his book with nearly 300 pages of self help info and you’re sure to find something in there that will help your game. 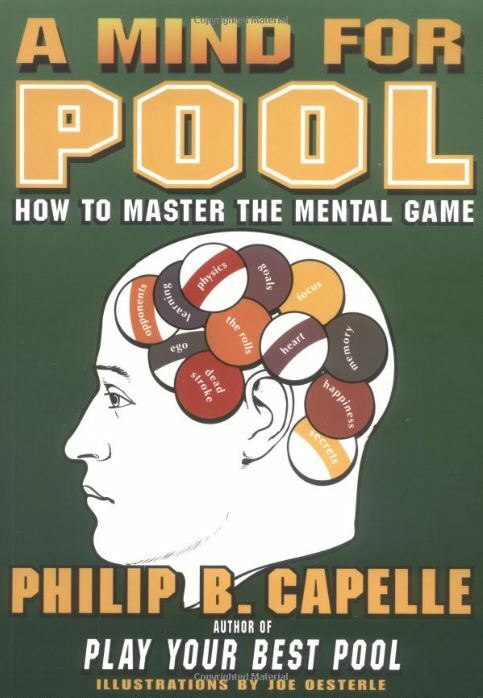 Capelle is also the author of play your best pool, which I consider a great book. (by far his best offering) On a scale of 1 – 10 I would give this a 7.5. I don’t think it’s the end all be all of the mental approach to pool but it is well worth the money. If you find this book useful I would also like to suggest a book called “The Inner Game Of Tennis”. It is quite possibly the best book I have ever read on the mental aspect of competing.